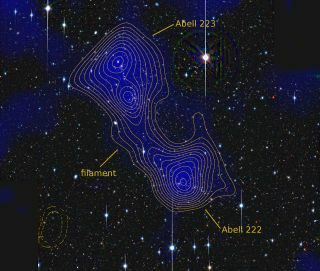 A July 2012 study of the galaxy clusters Abell 222 and Abell 223 found they are connected by a dark matter filament, shown here. The blue shading and the yellow contours indicate the density of matter. The image on the sky is about twice as big as the full moon. This story was updated at 9:32 a.m. EDT on July 5. A giant string of invisible dark matter has been discovered across the universe between a pair of galaxy clusters. The filament forms a bridge between two huge clusters called Abell 222 and Abell 223, which lie 2.7 billion light-years away. The universe is thought to be filled with such strings of dark matter, a mysterious substance that cannot be seen, only sensed through its gravitational pull. Scientists have made previous attempts to find dark matter filaments, which are predicted by theories that suggest galaxy clusters form at the intersections of filaments. Dark matter is thought to make up 83 percent of all matter in the universe. "This is the first time [a dark matter filament] has been convincingly detected from its gravitational lensing effect," said astronomer Jörg Dietrich of the University Observatory Munich, in Germany. "It's a resounding confirmation of the standard theory of structure formation of the universe. And it's a confirmation people didn't think was possible at this point." According to Albert Einstein's general theory of relativity, massive objects warp space and time around them, causing anything traveling through it, including light, to proceed along a curved path. When light from a background object, such as a galaxy, passes nearby a massive cluster on its way to Earth, its image will appear bent because of the crooked path its light traveled. "The standard wisdom is that the gravitational lensing of filaments is too weak to be detected with current telescopes," Dietrich told SPACE.com. "Only when we realized this system has such a peculiar geometry did we realize we have a chance." Abell 222 and Abell 223 are arranged so that they appear very close together against the sky, but are farther apart along our line of sight looking away from Earth. This means that most of the mass of the system is condensed into one small area of the sky that any light arriving at Earth from behind will have to pass though, boosting the gravitational lensing signal. The astronomers used observations from the public archive of data collected by the Japanese Subaru telescope on Mauna Kea in Hawaii. "The data was observed in 2001 and just had been sitting in the archive and no one ever used it," Dietrich said. "It took a while for us to realize that this data is around." Though the gravitational lensing was too weak to notice by eye, the team used a statistical analysis of light from more than 40,000 background galaxies to determine that unseen mass in between the two galaxy clusters was warping space-time. The work follows up on a 2008 study Dietrich worked on, which found hot gas in the area of the filament, suggesting its existence. However, that study did not detect a signal from the dark matter directly. The researchers would love to search for dark matter filaments around other galaxy clusters, but say they haven't yet found any good candidates that might cause lensing strong enough to be seen from Earth. Editor's Note: This article was changed to correct the percentage of all matter in the universe that is dark matter, which is 83 percent, not 98 percent.